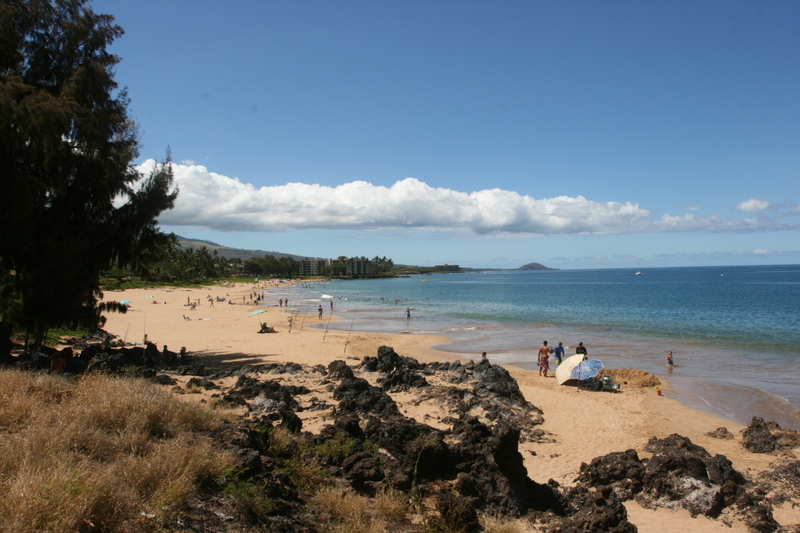 South Kihei has some great beaches where you can walk for miles. 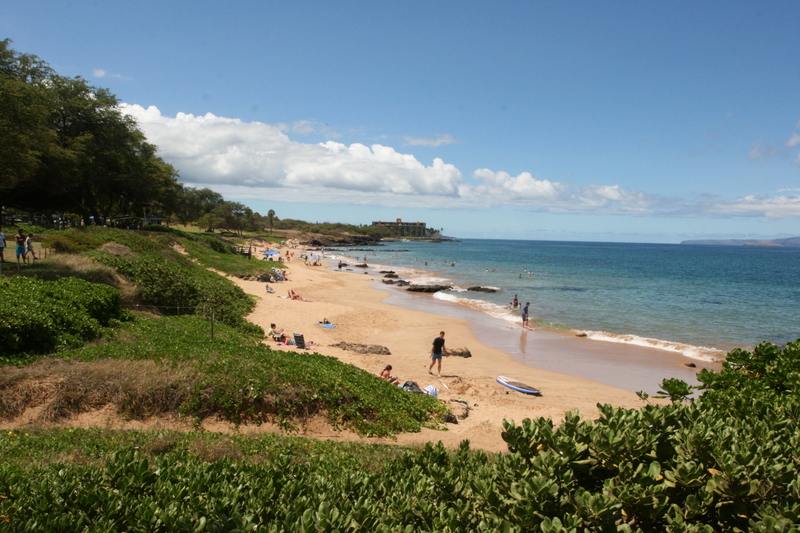 This 90 minute walk starts and ends at Charley Young Beach, across the street from our condo at Maui Vista. The round trip is about 3 miles – so the pace is leisurely. Most of the walk is on sand but there are a few places where you’ll want sandals. Don’t forget the sunscreen and be sure to carry water. Start at the north end of Charley Young Beach near these rocks. 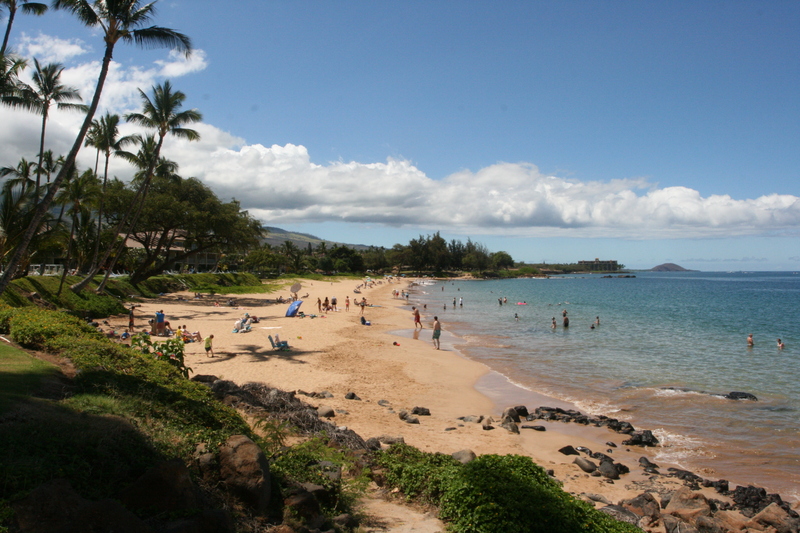 About halfway down the beach, Charley Young becomes Kamaole Beach Park I. 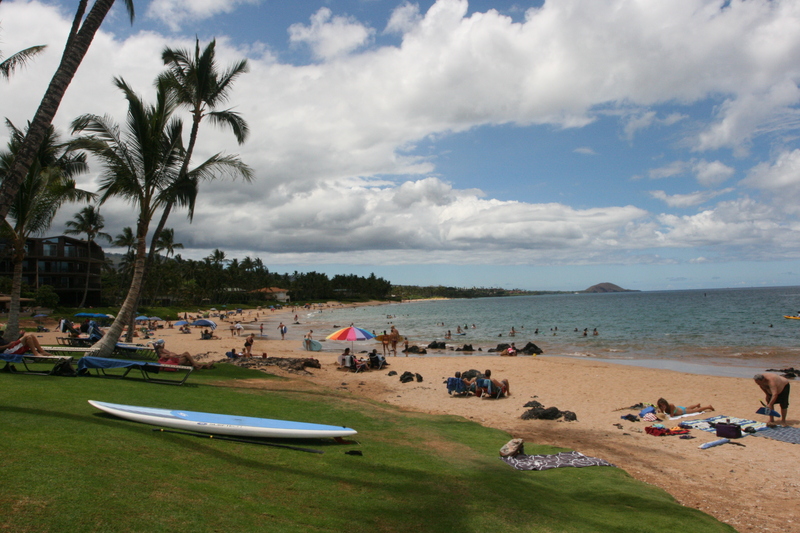 Note that all three Kamaole parks have lifeguards, restrooms and showers. 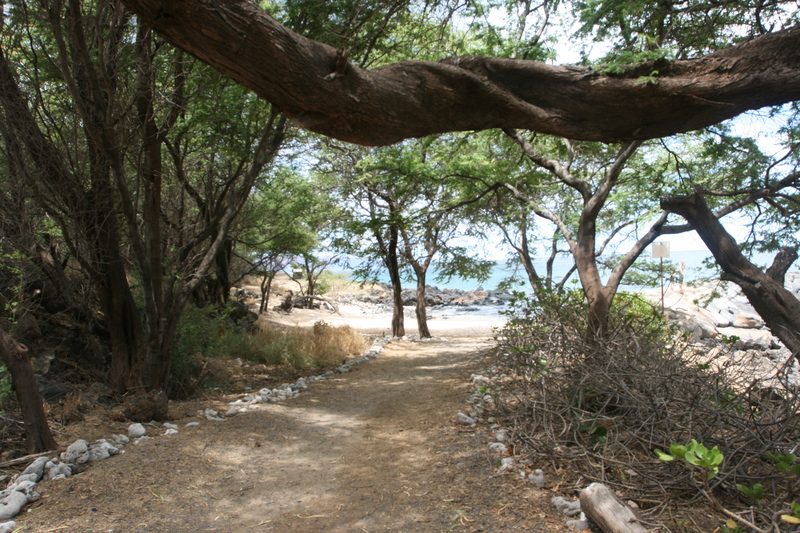 Take the sandy path at the south end of the beach and use the short public access pathway on the makai (water) side of the Royal Mauian Condos to get to Kamaole Beach II. Check the water as you pass the Royal Mauian. You can often see turtles swimming and feeding off the point. You may want your sandals at the south end of Kamaole II as you climb the short slope to the large grassy park of Kamaole III. On the weekends, this park is a favorite place for local families to host children’s birthday parties. You can walk through the park on the grass or return to the beach. 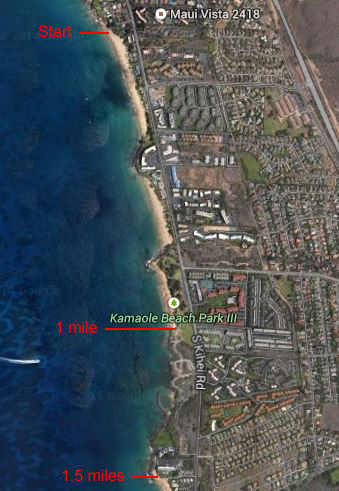 The south end of Kamaole III is about a mile from the start of this walk. You can turn around here or put on your sandals for an entirely different experience. 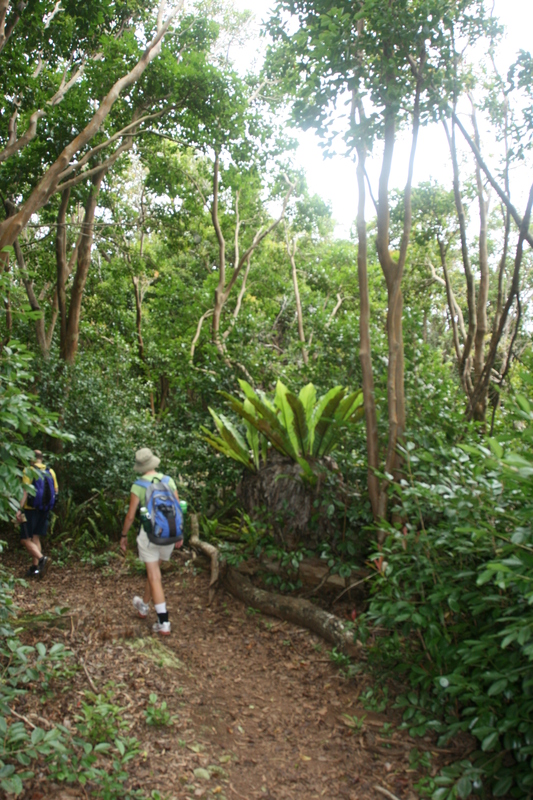 If you continue on, stay on the paths that crisscross this natural area – it’s a nesting habitat for the Wedge-tailed Shearwater. 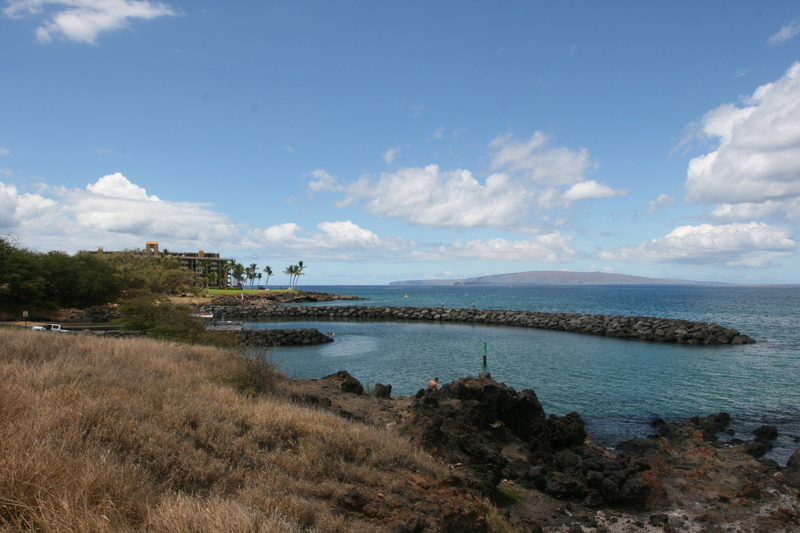 You’ll soon see the jetty at the Kihei Boat Ramp. 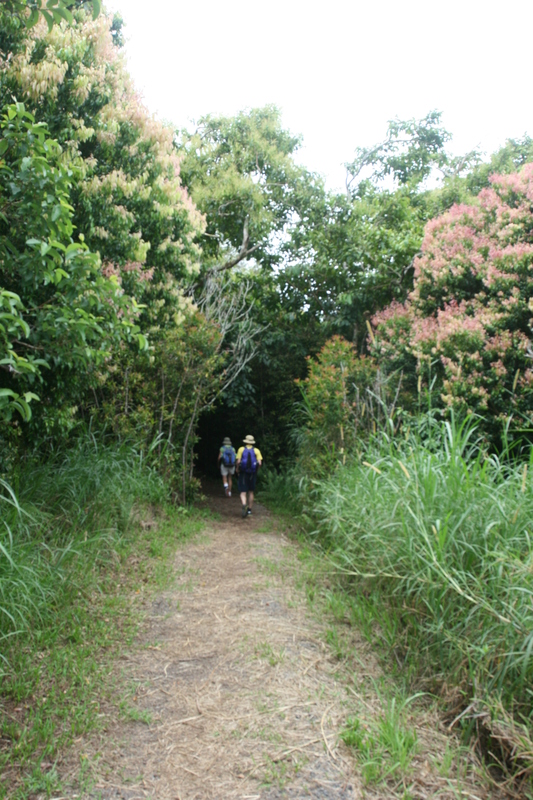 Walk under the shade trees on the makai side of the boat ramp parking lot. Cross the boat ramp and look for the path just to the right of the paved driveway with the “Do Not Enter” sign. As you round the corner of this short delightful path you’ll come to the grounds of the Kihei Surfside resort. The public access pathway is next to the water. Continue on the boardwalk past the tall Mana Kai Maui Resort and the 5 Palms Restaurant to the north end of Keawakapu Beach. Turn around here or, if you’re really ambitious, stroll down Keawakapu Beach. 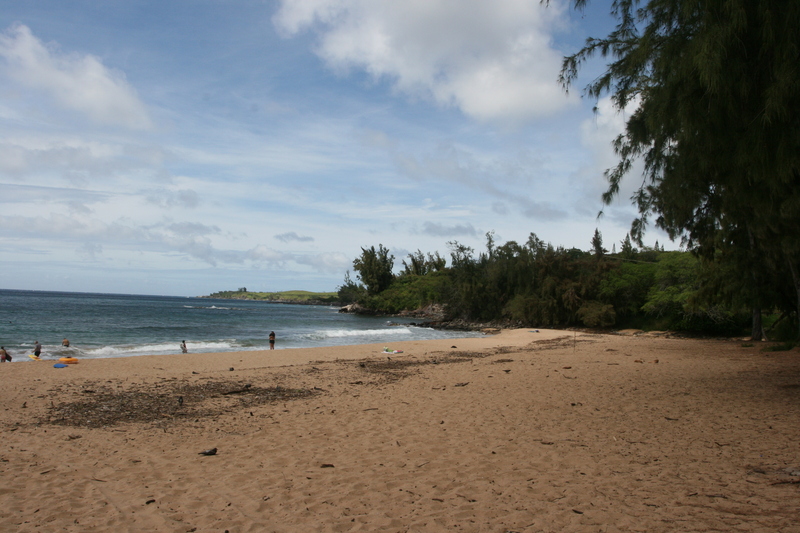 It’s another mile to Ulua Beach – just past the last bit of sandy beach in the distance. 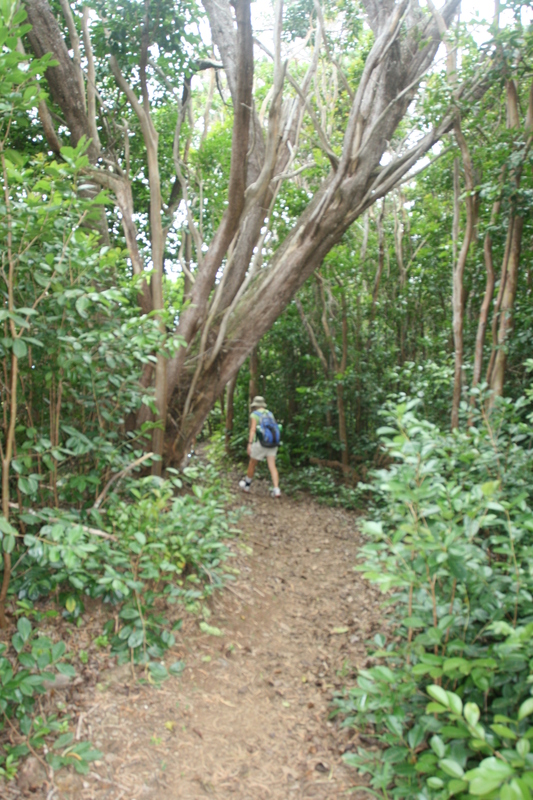 This lengthy but mostly shady hike takes you through beautiful and diverse vegetation with occasional spectacular views into the lush West Maui Mountains and out to the blue Pacific and the islands of Lanai and Molokai. 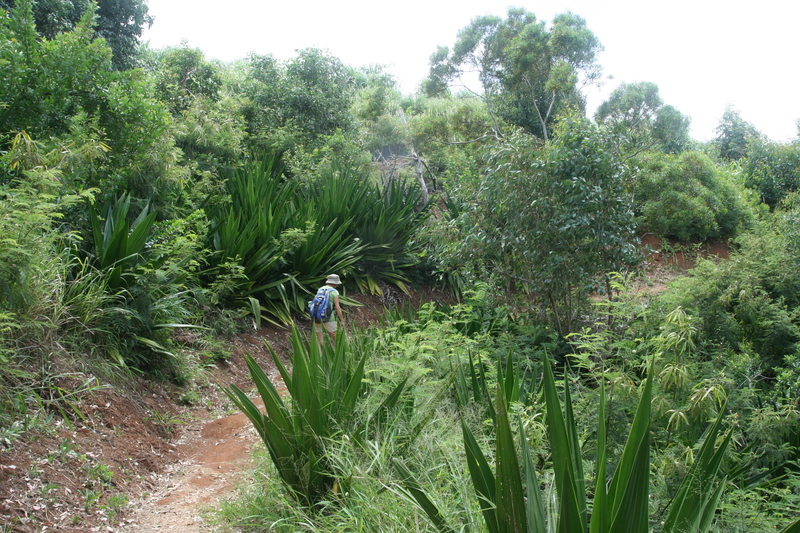 The first mile of this 6.5 mile hike is uphill – not steep, but always up. The remainder is mainly downhill with short uphill stretches. Parts of the trail may be muddy, so wear appropriate walking/hiking shoes. You’ll be in the shade until the last mile or so where the sun can feel very hot. If it has rained recently, there may be slippery places. Allow 3+ hours. Bring snacks and plenty of water. 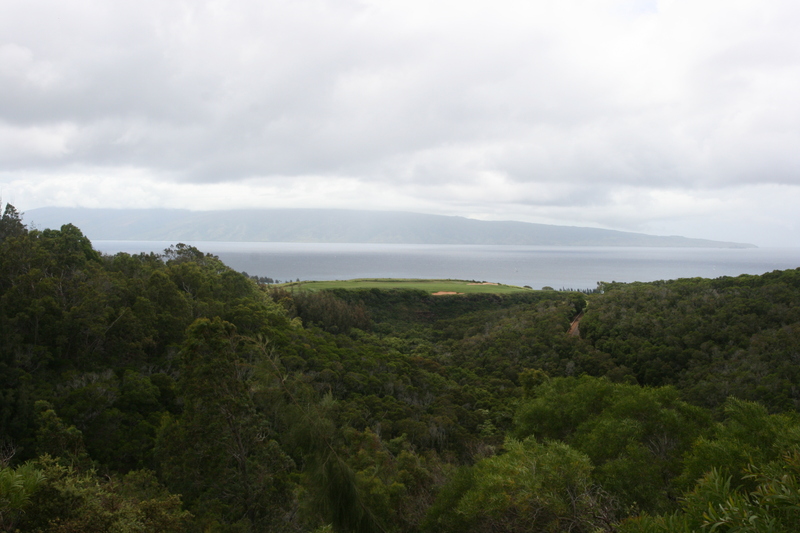 A free shuttle takes you from the Kapalua Resort Adventure Center to the trail head. There is no other way to get there except by hiking the trail backwards, which is not recommended. 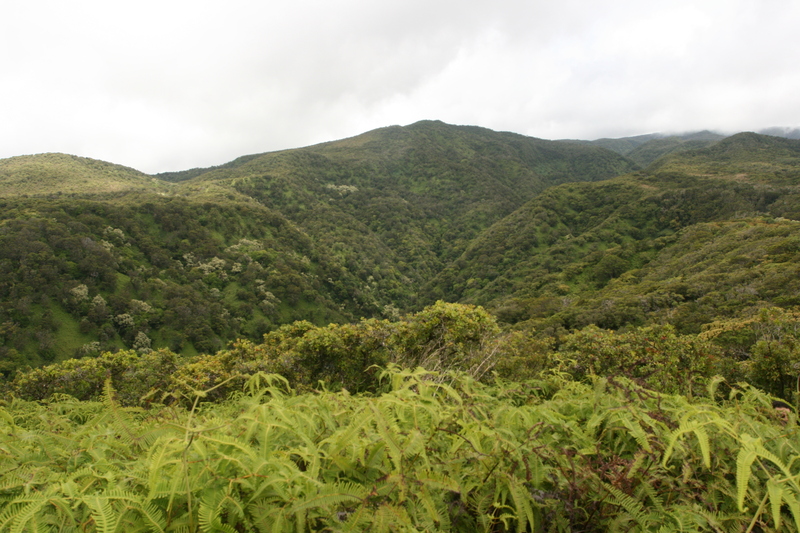 Call the Adventure Center (808 665-4386) for driving directions, departure times, and to reserve a place on the shuttle. The trail ends at D. T. Fleming Park and beach, a short walk from the Adventure Center where you left your car.